Meaning of Name: Used to be called Keningau but his name was changed to Julaini to avoid confusion with another sun bear at the centre, also called Keningau. Besides coming to the centre in July, he was also named Julaini after the head welder who constructed the new bear house. Together with Ah Lun, he is the first resident of the centre’s new bear house. History: Arrived to Sepilok from Lok Kawi Wildlife Zoo on the 3rd of July 2010. Julaini was previously kept in a small cage for a very long time. Personality: Although he has a cataract on his left eye, Julaini does not seem to have any problem finding his way around the forest. He will find a forest route by himself. He goes out to the forest with his adult bear friends, Ah Lun, Rungus, Fulung and Ah Bui. The loving care from his pals is helping him to learn how to be a bear. 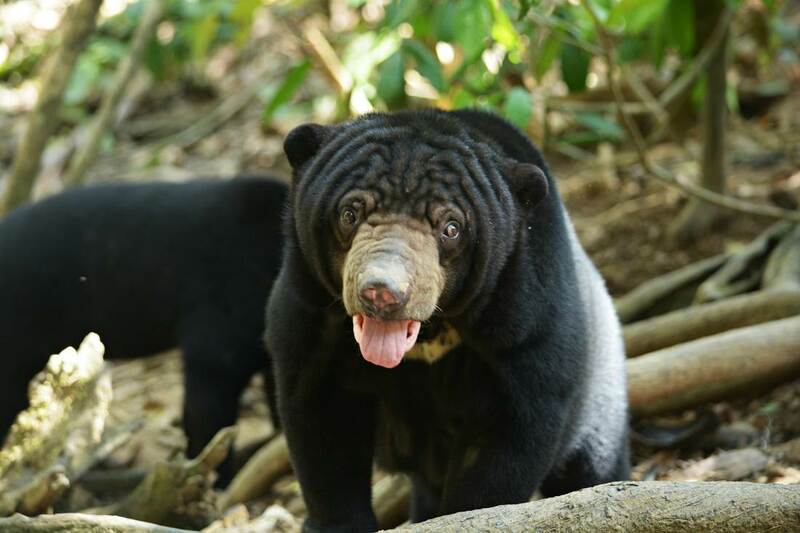 Although sun bears are perfectly adapted to life high up in the trees, Julaini is not keen on climbing trees and building tree nests, instead he will spend his days eating, foraging, relaxing and playing with his playmates in the dense forest. Julaini loves digging deep into the soil. Identifying mark or trait: Has a white dot to the left of his left eye which is suspected to be a cataract. Julaini is available for MY BEAR adoption.